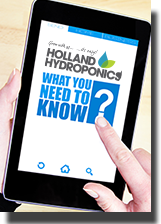 At Holland Hydroponics we are committed to offering the best range of hydroponic products at the best possible prices, this is why we have our Price Match Guarantee whereby if you find an identical product at one of our competitors for a lower price, we will match that price! If you are wanting to place a large order with multiple products, for example, you're setting up a grow room from scratch and require a full set up including tent, lights, extraction, nutrients, grow media and everything in-between, then get in touch and we will aim to match, or even beat any quotes you’ve already got. Our Price Match Guarantee is in store only and at the discretion of our sales staff. If all the requirements are met, we will happily match any price, but the final decision is ultimately down to our staff as they may ask for further evidence in order to qualify.